The main building of the National Energy Technology Laboratory on Queen Avenue this morning. 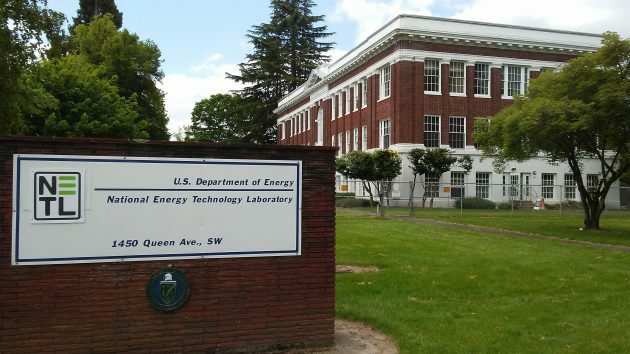 It was not unexpected, but the news is still a blow to Albany: The Trump Administration plans to close the Albany branch of the National Energy Technology Laboratory and transfer its work and equipment to Pittsburg, PA, or Morgantown, WV. The administration’s budget proposals for 2018 came out Tuesday. Word of what it meant for the Albany Research Center of NETL spread this morning. The wife of an employee there told me about it. A couple of hours later Omer Dogan, vice president of Local 1104 of the American Federation of Government Employees, emailed a press release. 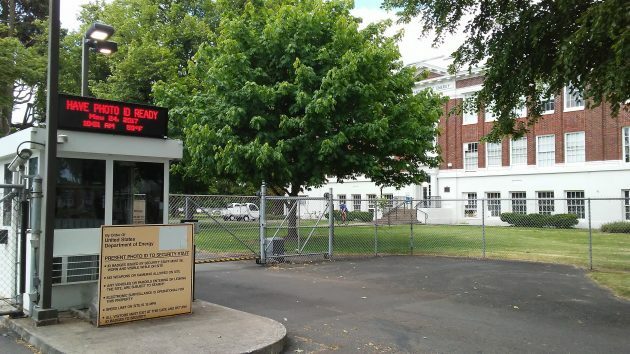 Closure of the Albany lab would cost the mid-valley about 150 jobs, many of them highly specialized in materials science and related fields. The loss to the local economy would be about $30 million a year, according to the union. It’s ironic that the president’s program to redirect federal research programs would hit the economy of a county where Trump enjoyed strong support in the 2016 election. The president’s budget was immediately criticized by Democratic Congressman Peter DeFazio, but he didn’t mention the Albany lab in his critique even though it’s in his district. The last time the government tried to close the research center, then still a part of the Bureau of Mines, was in the 1980s during the Reagan administration. But efforts by Republican Congressman Denny Smith got the administration to keep it open and assign it to the Department of Energy after the Bureau of Mines was abolished. The Albany lab’s scientists and technicians have been researching ways to improve technology related to fossil fuels. For example, currently the lab is advertising for a PhD-level researcher to work with a team on improving materials that would reduce methane emissions from natural-gas pipelines. It also is looking for someone to work in research on assessing the risks on things like gas shale, oil and natural gas development. Another research project deals with reactor systems for the gasification of coal. And there’s work, either going on or planned, on finding better materials for use in “magnetohydrodynamic” power generators. These are machines that shoot the hot exhaust from burning fuel through a magnetic field to generate electricity. Since some time after 9/11/01, the center has been fenced and access to the campus controlled. Kind of seems like on a lot of Trump proposals rural residents are getting the short end of the stick… guess you reap what you sow. Isn’t there still some contamination on that property? If there is, we should look for ways to require the Feds to fund remediation costs. It might be less expensive to continue to operate rather than closing. Either way, they should not be able to leave our community without remediation. 60% of Linn County voted for this. Apparently, voting for Peter DeFazio didn’t help either. I would like to see the Dept. of Energy provide a detailed transition plan for the site and buildings if they follow through on the closure. It is a rather large campus for a 150-person workforce. It would be unfortunate to see this eventually become an empty site, overgrown with grass and weeds. tRump voter gets what tRump voter deserves. The Grifter and Chief’s budget also slashes Medicaid and Social Security. All the while, he is asking for $25.7 Million more to protect his NYC skyscraper. On top of $6.3 Million already allocated to his direct benefit. Comments from some indicate this budget is DOA. But who really know what will and won’t be in the passed budget. It boggles the mind that 36% still approve of this con man. Not only does this minority approve of him, they are all in. SAD! Medicaid will NOT be slashed as you say…..the future raises just won’t increase at the current rate. Quit reading the fake news! Oh, I don’t and I certainly don’t watch Faux News. The chances of Trump avoiding jail time grows slimmer each day. The only thing he will be closing is his cell door. 150 jobs 30 Million a year sounds like way overpaid that’s like 200,000 a year no wonder there closing. Relax. Trump is already ineffective, with greater ineffectiveness over the horizon. Pence will be caught up in the maelstrom. Rex Tillerson will assume the throne, or Paul Ryan. It won’t matter. The govt. will run on a series of C/Rs until the next election when the GOP will be spanked. That would be terrible for the city of Albany. I personally know people who work there. I hope this does not happen. It’s not just salaries but also supplies, services and everything that goes into running the place, obviously.